I once had a GM who was absolutely against French wines. We had a pretty diverse wine list. Lots of California. A little Washington and Oregon. Italy, Spain, Germany, Chile, New Zealand and Argentina. I learned a lot about wine from that restaurant. Mostly because I became friends with the wine reps and took a keen interest in vino, but also because we had some really decent bottles to sell. But not a single wine from France. I mean, who ignores France of all countries when it comes to wine? They practically invented the stuff. But because of this strange GM quirk, I really never learned much about French wines. And lately, as I am studying more for further wine certifications, I’m finding that I just may like French wines more than any other wines. Thanks a lot for keeping them from me, Joe. What the heck. Oh, and six of the eight bottles were French wines. But when I ran my card for $84ish at the check out and walked out legally with eight really decent and highly rated bottles of wine, I knew I had to share some of these finds with you. Although, I guess I can only include these wine in the “Affordable Wine Reviews” because of BevMo. Normally, the wine I am drinking tonight goes for about $20 a bottle, but with BevMo’s 5cent sale (which I am convinced is always on) I got two bottles tonight for $20.04. One for $19.99 and the second for 5 cents. So technically, just about $10 a bottle. So if you are lucky enough to have a BevMo around the corner – or don’t mind spending up to $20 – check this out. Just a quick lesson before I tell you how delicious this wine is. 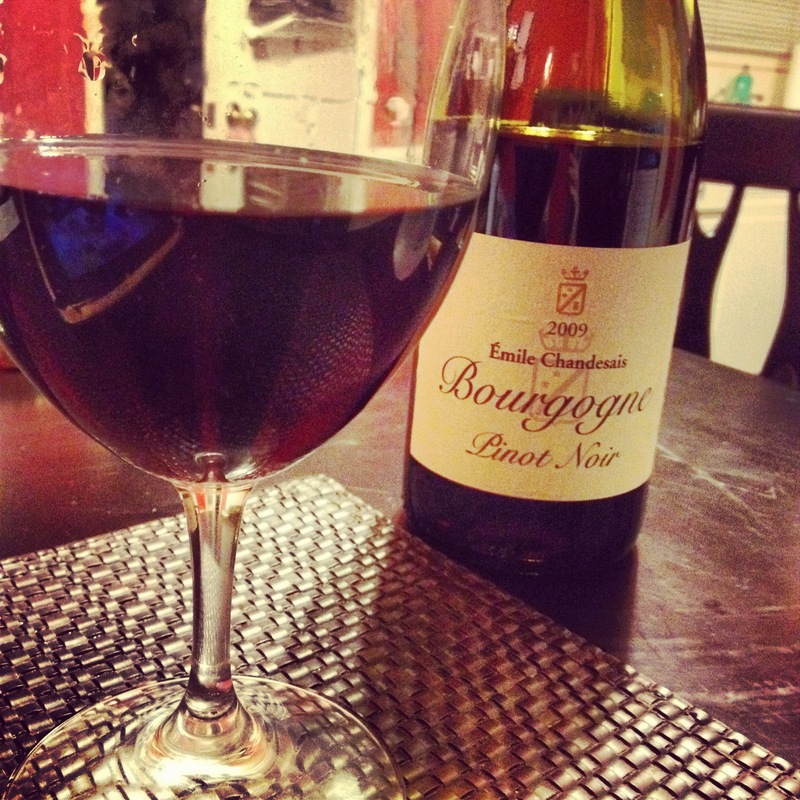 A bottle of wine that says “Bourgogne” (French for the Burgundy region of France) is either a Pinot Noir (Bourgogne Rouge – red) or Chardonnay (Bourgogne Blanc – white). In France, wine laws go back hundreds of years, and they really don’t mess around. Regions are allowed to produce only certain varietals of wine if they want to put the region’s name on the bottle. And this is only the tip of the French wine-law iceberg. Percentages of grape varietals, years aged, types of aging – its all controlled. Not just anybody can move to France, grow some grapes, ferment them and sell them as a $500 bottle of Bordeaux. Which is all part of the French wine fascination for me. So this evening, deciding between a Cote de Rhone or a red Burgundy, I went for the lighter wine. This particular Pinot is only 12.5% alcohol, which I appreciate on a night when I’d really like to stay semi-sober through more than a couple glasses. I put my first glass through a Vinturi to open it up a little and sat back as Brad whipped us up a little late-night grub. The wine is light with bright fruits, a hint of smoke, and just enough earth that I wouldn’t call it fruity. The cranberry and cherry notes give a slight tanginess that complimented well with the salty, smoky flavors of the chorizo in the polenta Brad made. It is light enough to sip on a warm night, but had enough body and depth to keep me interested on this chilly Santa Monica almost-summer evening. This Pinot, and most others, can be paired with many different kinds of dishes, but can also hold its own alone. I taste wines like these and wonder how anyone could avoid France as a category ever. With 90 points from Wilfred Wong – BevMo’s wine reviewer- I might just stock up on a few more bottles of this vino before it is no longer on sale. Two bottles for $20 is a score. My only other piece of advice? Pinot isn’t typically the wine to buy cheap. Pinot Noir is the most finicky varietal to grow, do well and do right, so it is often well worth a few extra dollars to get a well balanced, distinct and enjoyable bottle from a wine maker who knows what they’re doing. So many of the bargain Pinots out there taste watered down, overly fruity, or too acidic. A good bottle of Pinot will be worth every cent, so unless stop find a great deal like this one, I will warn you against buying a Pinot under $15. The first time I had a French Pinot Noir I nearly left my body. Mind altering experience, especially considering how different California Pinot Noirs can be. 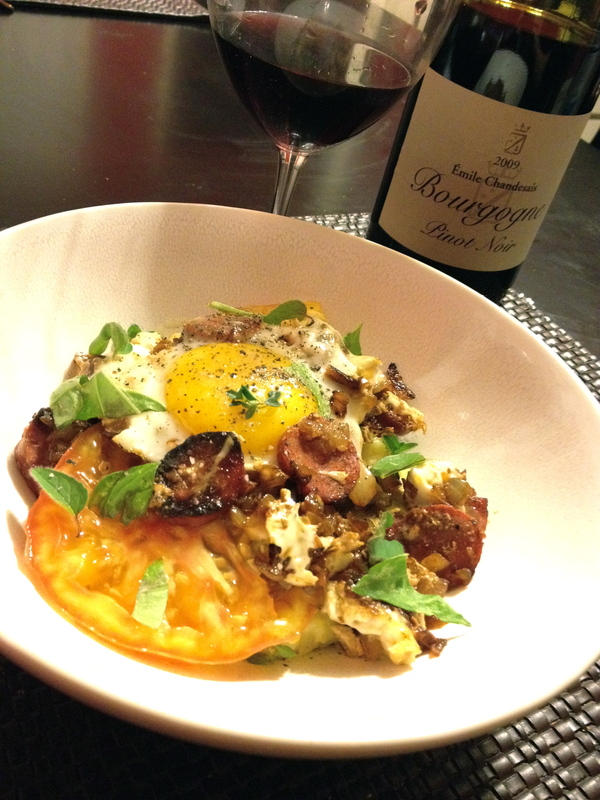 The second time I left my body was after trying an Argentinian pinot noir from Patagonia. Try Manos Negras from Argentina, awesome Pinot Noir. Also, Wilferd is the Cellar Master at BevMo, you’ll find a lot of the product he’s had specifically made on the shelves there — Dark Hundred and Crooked Path Zin come to mind. Pinots are the most fickle grapes, but also the most rewarding. I love how you describe your experiences with them! In every glass of really amazing Pinot Noir there is the story, sweat, tears, and joy of a winemaker who got it just right. It can be heaven. PS. Which BevMo is Wilfred at? I’d love to try and catch him sometime! Wilfred Wong’s office is in Concord Ca. It’s a corporate position kind of thing. Catch him if you can. He vineyard hops the globe and tastes 8,000 wines a year. Nice gig, I guess. You are a beautiful aesthetic soul. Your chef husband and you are indeed lucky to have found each other. I’m writing to inform you that the oh so lithesome 2009 Chandesais Pinot is currently on the BevMo 5 cent deal at an astounding $14.99. So, run (fly?) before they’re all gone forever. When you and Brad become the new Mark Peel and Nancy Silverton (YOU as sommelier, not baker), just remember me, ok? I own wines that are older than you that need to be consumed by people who can appreciate them. Brad cooks, I bring the wine, you radiate. I have a friend in Santa Monica, an architect who lives in an amazing house there that she designed. She and her late husband used to run The Wine Pavilion at the L.A. County Fair. We can have the dinners at her place. As for me I used to conduct wine appreciation classes for three universities: CSUN, UCLA and USC. Do you know anyone else who can make that claim? No, I’m not crazy, well, maybe a little (aren’t we all, though? ), but this is all true and I have to admit, I had fun writing it. So before you folks relocate to NY, let’s see if we can vibe it out, ok? I mean, if you’re interested. I have about 300 bottles of wine, 1,000 cigars, no car, a lot of bills, an intuitive eye for talent and a pretty damn good sense of humor, too. Ok. Slow down. Breathe. That’s better. Your words are so kind! Brad and I are, indeed, very lucky to have found each other. We have plenty of exciting culinary journeys ahead of us, and I can’t wait to share them all with you! Come visit us at one of our restaurants next time you are in Santa Monica. And thank you for reading!! Hey, Kels, I thought you might like to know that there’s a mention of your blog and the above excellent wine review, in my latest article, which in fact came out today in the current issue of CigarAdvisor.com. And I’m downing another bottle of Chandesais Pinot tonight for good measure. Thank you so much for the shout out! I have gone through a few bottles of this Pinot now, and it’s turning into a staple on my wine rack. I love the idea of pairing wines with cigars! Maybe experiment with a big, juicy Syrah or a bold and spicy Monastrell. Ice wines are another kind of sweeter wine that could be a substitute for that Port that pairs so well. Cheers, and thanks again!